One of the panels displayed at Royal Botanical Garden Edinburgh. WHEN you live in the homeland, all things – the city, the people, the food – seem typical and they are naturally present as well. But for those going abroad, the smallest details that remind them of the homeland have new meanings. Of course, you may disagree with me as I am a homely person. The only home I have on this earth is Sarawak. Do you have the tendency to identify yourself as Anak Sarawak first, then, when eyes of wonder are seen, add in the fact that Sarawak is in Borneo? Then, maybe finally, you say Malaysia. I was that Anak Sarawak touring Scotland last week while the more valid reason was to visit my son. He was the tour guide, planning everything – from accommodation and food to places to visit. The boy was excited about the trip to Royal Botanic Garden Edinburgh (RBGE). The weather was cold. I thought a walk in the Botanical Garden could keep us a little warm but what was there to see with winter just over? “There is a glasshouse. I’m sure flowers are blooming there,” my son said with confidence while rushing us through the lunch so that we could have ample time to walk around the garden before it closed at 5.45pm. Let’s settle with it then. It would be a bonus to take refuge in the warm and welcoming greenhouse. The Tourism Malaysia logo is printed on the right-hand bottom of the glasshouse panels. Honestly, with papaya trees, pineapple shrubs and familiar orchids around, I was, at first, more interested to know how many Tourism Malaysia logos were printed on the panels – some 10 of them – detailing the scientific significance of each plant and how much it costs. So I asked the staff manning the entrance of the facility but he had no idea – and wasn’t too keen either to give me more information so that I could find out. Most visitors to Scotland would have heard of the Malaysia Trail, accessible via the glasshouses of RBGE. It espouses the exploration of the beauty of Malaysia’s flora from a different perspective in a specially created environment. The most fascinating section is described as Wonders Below, featuring a variety of plants, including herbs, climbers, stranglers and epiphytes, that flourish beneath the tropical trees. On the panels is information on the scientific significance of these Wonders. About 30 per cent of all flowering plant species in Malaysia are herbs which display an amazing range of flower forms, leaf shapes, textures and colours. Featured in this section are gingers, African violets and ferns thriving especially well under the canopy and using trees as support. Undoubtedly, walking the Malaysian Trail is an eye-opening experience for this Anak Sarawak. At the end of it is an information panel promoting Malaysia – apparently to help visitors make up their mind to visit Malaysia. The Trail was launched on Oct 9, 2012 by the then Tourism Minister Dato’ Sri Dr Ng Yen Yen, reported to be the person central to the inception of the Trail. According to RBGE website, Ng believed the partnership was a uniquely special way to allow British residents – and tourists visiting Edinburgh – a clearer insight into the magnificent natural resources of our vast multi-cultural land, besides serving to further boost relationships and reciprocal tourism between Scotland and Malaysia. “Malaysians are known to be warm and friendly, the country’s geography is as diverse as its culture, as recently witnessed by the Duke and Duchess of Cambridge during their tour of Malaysia which included a side trip to see the rainforests and gardens at the Danum Valley Conservation Area,” Ng commented. “This means we have splendidly extreme contrasts – from the cool hideaways of the highlands rolling down to warm sandy beaches and rich, humid mangroves. The new display at Edinburgh presents this landscape in an exciting new way. In the longer term, perhaps it may even encourage more people from Britain to visit Malaysia and experience our magical country first hand,” she reportedly said during the launch. It was also reported that the initiative came after Dr Peter Wilkie, tropical botanist, received a request in 2011 to show Ng around RBGE. Wilkie said Ng was enthralled and she told him she was looking at new and innovative ways to get people to visit Malaysia rather than just using standard advertisements. A Scottish paper also reported that RBGE was helping Tourism Malaysia to raise the profile of the homeland as well as that of the indigenous flora to enhance its image as a hub for botanical research. This will be a win-win situation. 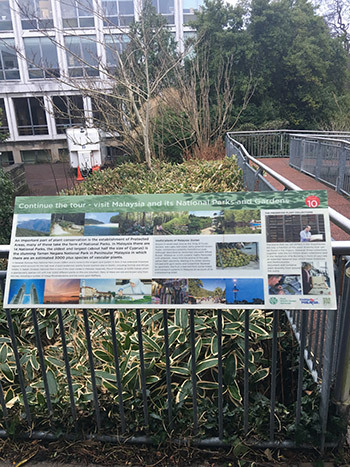 No doubt, the Malaysian Trail in the Greenhouse of RBGE with at least 10 glass panels, showcasing close to 600 species of plants from Malaysia, has been a source of education and knowledge for visitors to the country of bagpipes, plaids and kilts. To me, the Malaysian Trail also brings the warmth of home closer to a foreign land on a cold wintry day. In my job as a journalist, I am rather curious to know the kind of awareness and desire that would prompt visitors from RBGE to travel all the way to Malaysia to see the local plant species in their natural habitats. In other words, how many of the visitors from there have been impressed or feel encouraged enough to visit Malaysia? I am also curious about the making of this Malaysian Trail. How much did it cost? Who is bearing the maintenance of this Trial now? How much have we funded to be listed on the several panels put up at the Malaysian Glasshouse Trail in Britain? Thinking aloud – may be this Trial serves educational purposes for students and researchers more than a tourist draw? It makes absolute sense for Sarawak Tourism Board to take advantage of this existing Trial to man some people there to market Sarawak to draw visitors from Scotland, England, Wales and Ireland. Previous ArticleAre we going less and less secular?